I don’t think I’ll be using my Keurig much anymore. 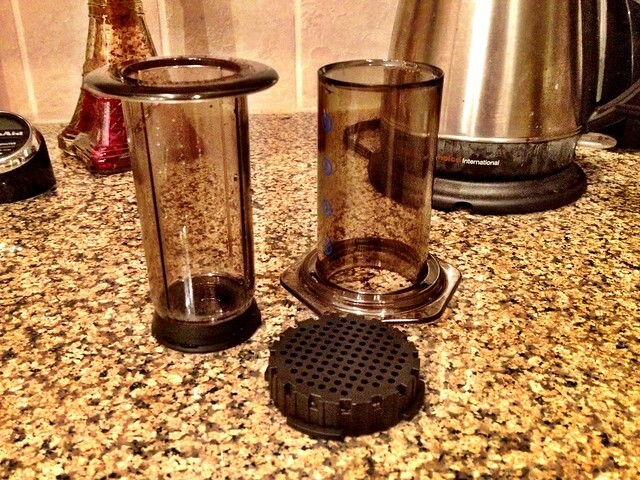 I’m extremely late to this party, but I only recently discovered Aerobie’s Aeropress coffee maker. Yes, the company that created those amazing ring-shaped flying discs also sells a weird-looking coffee maker. This plunger-like contraption helps to brew what is probably the best cup of coffee I have ever tasted. At first glance, it’s similar to a French press, but because the coffee is forced through a paper filter instead of a coarser wire mesh, there is little to no sediment in the resulting liquid. The coffee is described as “espresso-strength,” and I drink it as an Americano by adding a volume of water equal to two times the amount of espresso. I’ve made Aeropress coffe with dark and lighter roasts, and every cup of coffee has been exquisite. If you enjoy coffee at all, I highly suggest you acquire an Aeropress as soon as possible. Once you taste its delicious brew, you’ll understand why. It’s inexpensive, quick, easy to clean, and delicious. There are no downsides.